This week is dedicated to pop-culture, find out about Superman's moustache and MCU next phase plus more. 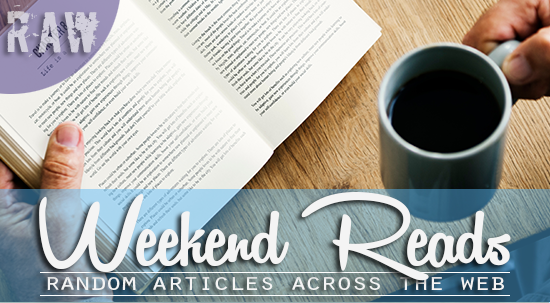 So when you have some time to relax this weekend, grab your favourite beverage and have a read of the following articles. Enjoy! Ever judge a book by its cover? Of course you have!Back in the day, that’s how I found every single book I read after walking into a bookstore. These days, the internet helps with spreading information like the cover that’s going to be on a book — far in advance of publication. Henry Cavill, who plays Superman in 'Justice League,' is alternating between shooting 'Mission: Impossible 6' and the 'Justice League' reshoots. The problem: Cavill has grown a mustache for his 'M:I 6' role, which is not in keeping with the look or the continuity of his role as Superman. And he's not allowed to shave. Marvel's cinematic universe is one of the most successful multimedia franchises in the world, so here is what this year's San Diego Comic-Con showed us about the future of the MCU. When Google shut down Reader four years ago,, they made it clear that they wanted to replace self-directed reading choices with an app that algorithmically choose what a user should read next. Citizen scientists may not have the time and equipment of their pro counterparts, but their dedication can sometimes lead to discoveries that would otherwise be impractical. Case in point: a NASA-backed citizen science initiative, Backyard Worlds: Planet 9, has found a brown dwarf (effectively, a failed star) relatively close to the Sun at 110 light years away. Roughly 165 million years ago during the mid-Jurassic, Madagascar is an alien place. The famously large island has yet to fully cleave itself tectonically from India and Africa, still crammed together with the rest of the southern supercontinent of Gondwana.